I’ve said it before, and I’ll say it again…Friday night is noodle night! After one of the longest weeks at work in a while (I’ve clocked up 102 hours) I couldn’t be bothered cooking. 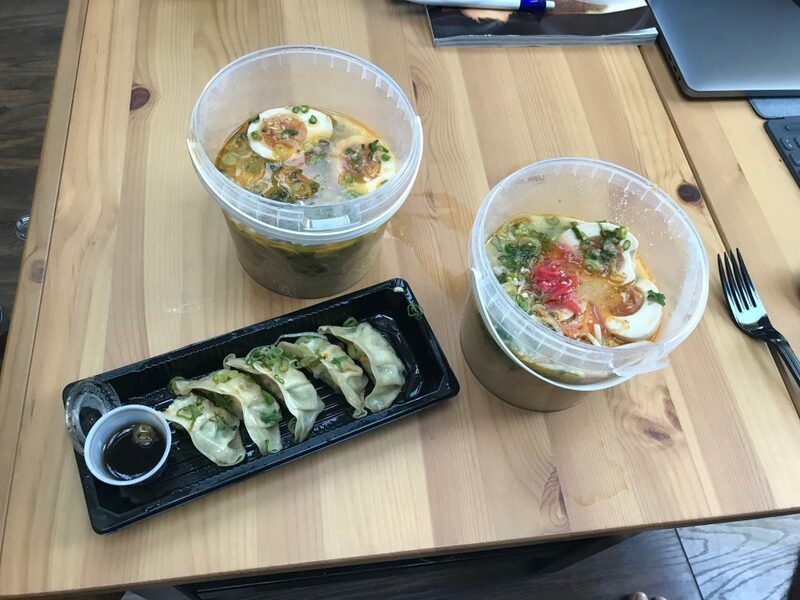 I didn’t fancy the typical takeaway staples, but thankfully found the nearby Koi Ramen on Deliveroo! I was skeptical about what they would actually be like when they arrived, but anything was better than slaving in the kitchen! This is sort of what ramen is all about, a quick, tasty and filling meal, with few frills. Noodles came packaged in plastic cartons which I’d associate with Play D’oh. But as is often the case, appearance isn’t everything. The menu options are limited. 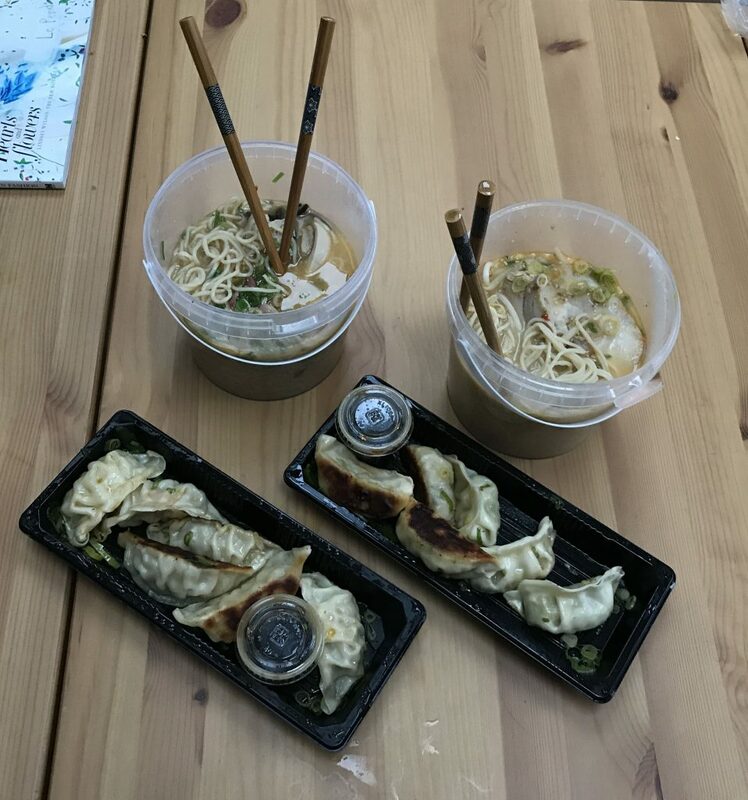 Choice of three types of gyoza (we tried all of them, obvs!) and choice of three types of ramen – spicy, normal and veggie. There was an option to add an egg (why would anybody not?!) 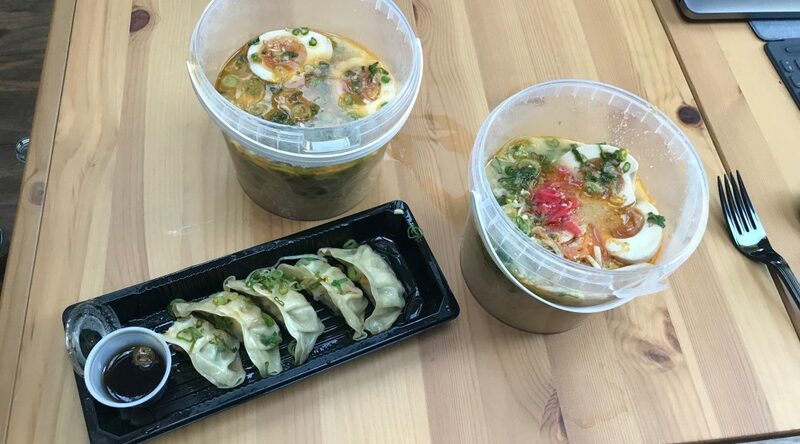 but this was not the customisable affair offered by other Ramen Resolution places. On our trip to Japan we sadly didn’t get chance to go to the gyoza museum in Osaka, but I understand that they’re relatively recent additions, only really becoming popular after the Second World War. The crispy gyoza were excellent. I think the chicken was my favourite. The miso pork bone broth was up there with some of the best I’ve had, and did that ‘stick to the roof of your mouth’ thing that, to me at least, indicates goooooood ramen. This is also the cheapest ramen that I have had since starting out on this quest. Admittedly we didn’t have alcohol but the whole lot came in at £28.50 between two of us. I’m giving a solid RAMEN (4 out of 5), but I have to add that this feels unfair.I’m marking it down only because I was eating it at home. I will definitely have to check out one of the three Koi Ramen popup restaurants for the full experience. The discovery of noodles to the door could be the start of a slippery yet delicious slope!